Wildflowers in the windswept meadow in the rough of the links course by the Highland Light in Truro caught my eye. The Highland Links dates to 1892. Several artists were painting Cape Cod’s oldest lighthouse which dates to 1857 for the Light on Truro painting event. I chose to focus my attention on the natural beauty of the Cape Cod National Seashore, rather than the architecture of the lighthouse. A sliver of the blue ocean beyond the trees balanced the blue of wild chickory and Queen Anne’s Lace in the foreground. This scene beside the Highland Historical Museum is a reminder of a bygone era when the building was a turn of the century resort hotel on the Outer Cape. I had a clear vision of the image that I wanted to capture in my painting. Soon I felt I had enough information to sign and frame the piece for an exhibit that afternoon at the Truro Library by the Addison Art Gallery called “Light On Truro”. The exhibit celebrates the Centennial of the National Parks and “Found Our Park!” which features art inspired by the Cape Cod National Seashore. “Queen Anne’s View” is available through the Addison Art Gallery. Technical Notes: Sennelier LaCarte pastel card with a variety of pastels by Rembrandt, Unison, Terry Ludwig, Girault, Sennelier, and Conte pastel pencil. My pastel, “Last Caper” has be accepted for the “For Pastels Only 2015” exhibit of the Pastel Painters Society of Cape Cod. 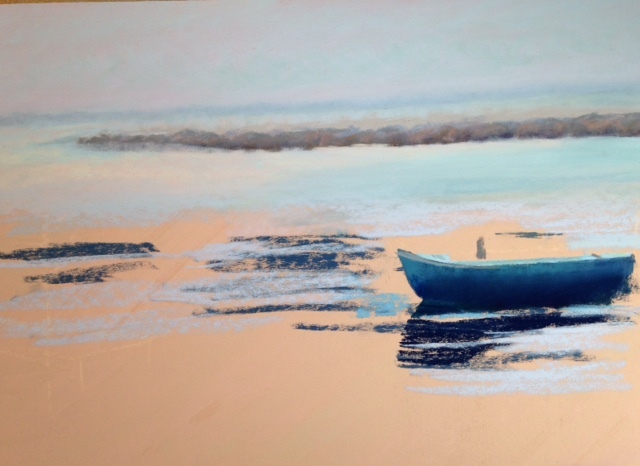 The show will be at the Cultural Center of Cape Cod in South Yarmouth, MA from June 17 to July 12. 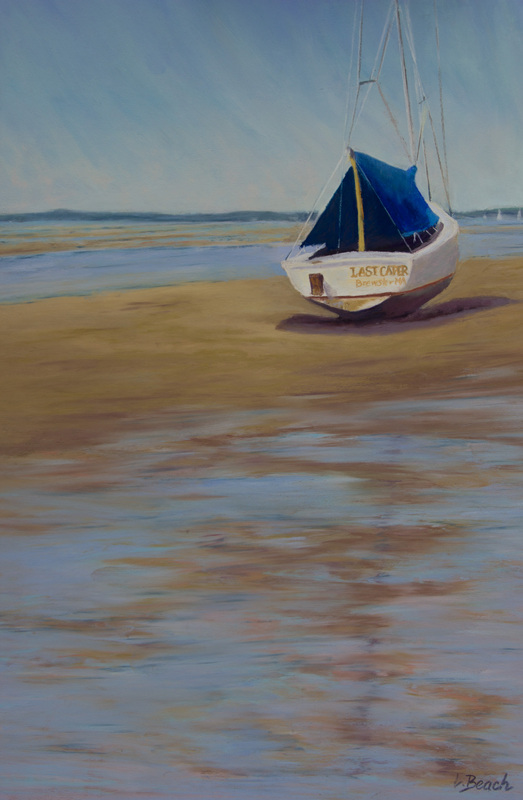 I was drawn to the lone sailboat marooned at low tide on the bayside of Cape Cod. The reflections of the mast were reflected in the shallow tidepools. To me the image coveys the quiet and peaceful places that are found on the Cape. I am thrilled that this is included in this prestigious pastel show. Artist, Marla Baggetta was the Juror of Seclection. Technical notes: I did an underpainting of watercolor on Uart #400 sanded paper that was mounted on archival board. 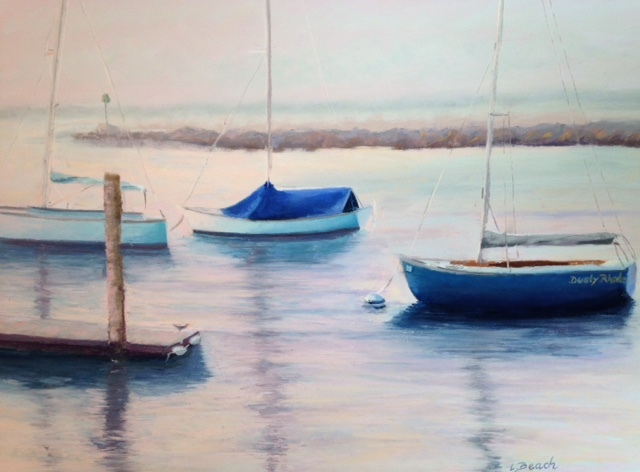 Various brands of pastels used included NuPastel, Rembrandt, Girault, Unison, and Terry Ludwig. Fine details were added with pastel pencils. 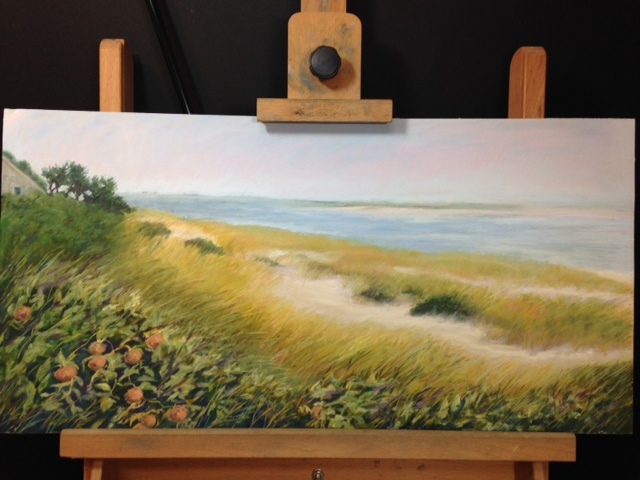 The latest painting on my easel is “Lighthouse Beach” in Chatham. When New Englanders raise a left arm and point to their elbow, they are referring to the town of Chatham, MA. Cape Cod which was formed by the ice age is shaped like an arm at a right angle and there sits Chatham with a quaint downtown, picturesque lighthouses, and barrier beaches. The beach is one of the outstanding beaches on the Cape at the base of Chatham Lighthouse. To access the beach one must go down a flight of stairs and the scene that I captured is looking to the North across the rose hips of the beach roses and beach grasses to the water beyond. The diagonal design that this emphasized seems to add something different from the standard horizontal prospective of sky, water, and land that most beach scenes offer. Lighthouse Beach seems to go on as far as the eye can see and I hoped that the painting captures this feeling. Technical information : I worked on mounted U art #400 to archival foam board. Pastels for the sky, water, and sand were mostly Unisons. Grasses and foreground foliage were mostly Rembrandt, Terry Ludwig, Sennelier, and NuPastels. 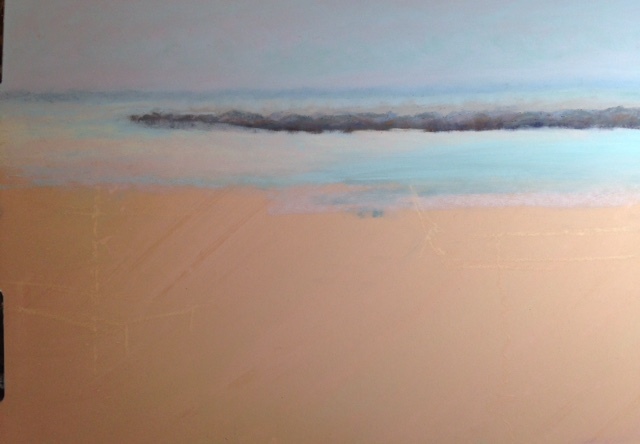 Painting this in the studio after a summer on the Cape was a good way to make the summer last a little longer.